In the summer of 1985, a mostly Hawaiian crew set out aboard Hokule'a, a reconstructed ancient double canoe, to demonstrate what skeptics had steadfastly denied: that their ancestors, sailing in such canoes and navigating solely by reading stars, ocean swells, and other natural signs, could intentionally have sailed across the Pacific, exploring the vast oceanic realm of Polynesia and discovering and settling all its inhabitable islands. Their round-trip odyssey from Hawai'i to Aotearoa (New Zealand), across 12,000 nautical miles, dramatically refuted all theories declaring that—because of their unseaworthy canoes and inaccurate navigational methods—the ancient Polynesians could only have been pushed accidentally to their islands by the vagaries of wind and current. Voyage of Rediscovery is a vivid, immensely readable account of this remarkable journey through the Pacific, including tales of a curiosity attack by sperm whales and the crew's welcome to Aotearoa by Maori tribesmen, who dubbed them their sixth tribe. It describes how Hawaiian navigator Nainoa Thompson guided the canoe over thousands of miles of open ocean without compass, sextant, charts, or any other navigational aids. 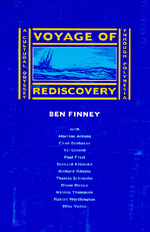 In so doing, it documents the experimental voyaging approach, developed by Ben Finney, which has both transformed our ideas about Polynesian migration and voyaging and been embraced by present-day Polynesians as a way to experience and celebrate their rich ancestral heritage as premier seafarers. By sailing in the wake of their ancestors, the Hawaiians and other Polynesians who captained, navigated, and crewed Hokule'a made the journey described here a cultural as well as a scientific odyssey of exploration. Ben Finney is Professor and Chairman of the Department of Anthropology at the University of Hawai'i. He is also co-editor of Interstellar Migration and the Human Experience (California, 1985) and the author of Hokule'a: The Way to Tahiti (1979).